A closer look at the key specs of two “entry-level” full-frame cameras, to help you decide which is right for you. Nearly five years have gone by since Canon announced the 6D. Now, the 6D Mark II is finally unveiled, we can start comparing it to others which are on the market. The 6D Mark II, just like its predecessor, is designed to be an entry into full-frame shooting for consumers who may not otherwise be looking at full-frame models. Nikon has its own similar offering in the shape of the D750, so, here’s a look at how the two cameras stack up against each other. Both of the cameras feature a full-frame CMOS sensor, but in terms of resolution, the 6D Mark II just edges it. It features a 26.2 megapixel sensor, compared with the 24.3 megapixels offered by the D750. One of the key improvements Canon made to the 6D Mark II over its predecessor was to bring the number of AF points up to 45 from 11 on the original 6D. Even more impressive is the fact that all 45 points are the more sensitive cross-type. Meanwhile, the D750 has even more focus points, at 51. However, only 15 of them are the more sensitive cross-type, so we’ll give this one to Canon (just). It’s a straight-up tie between the two cameras when it comes to fast shooting. Both top out at 6.5fps, which is a modest offering. 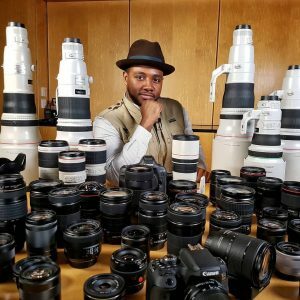 It should still be enough for reasonably slow-paced or predictable action, but if your main concern is shooting sports or rapidly moving subjects, other cameras are probably better for you. Another neck and neck situation here, both the cameras have 30 second to 1/4000 shutter speed available, as well as Bulb modes. The 6D Mark II has Canon’s latest (and best) processor, the DIGIC 7. Meanwhile, the Nikon D750 is a few years old and therefore uses the older EXPEED 4 processor – the EXPEED 5 is what you’ll find in newer Nikons, such as the D5. This could potentially mean that the 6D Mark II is a little better at high ISO shooting. Here the 6D Mark II has the D750 clearly beat (on paper at least). It has a native sensitivity range of ISO 100 – 40000, with an expansion setting up to 102400 available. By contrast, the D750 has a native range spanning from ISO 100 – 12800, with expansion settings up to ISO 51200 available. If you like optical viewfinders then you’re in luck as both of the cameras here feature them. However, the Nikon D750 bests the Canon 6D Mark II by offering 100% coverage. In short, that means what you see through the viewfinder is exactly what you’re going to get in your final image’s composition. On the other hand, the 6D Mark II only has 98% coverage, meaning there’s potential for things to creep into the edge of the frame without you spotting it. The Canon 6D Mark II is the only full-frame camera in the world to feature a fully articulating screen. That gives you maximum flexibility when it comes to composing from those all important awkward angles. It’s also touch-sensitive, which means you can fire off the shutter release from it, among other things. The Nikon D750’s LCD screen is slightly bigger than the 6D Mark II’s, at 3.2-inches (compared with 3.0 inches). While it doesn’t fully articulate, it tilts, which is still useful for some awkward shots. Both the cameras here offer Full HD video at frame rates up to 60p. It’s perhaps a little surprising that the newer 6D Mark II doesn’t offer 4K video shooting for standard video shooting, but it is available if you want to record a time-lapse video. For full-frame cameras, both the D750 and the 6D Mark II are on the smaller side. The 6D Mark II is the smaller of the pair, as well as being lighter by around 75g. They are both still quite hefty DSLRs though, especially when compared with compact system cameras. The Nikon D750 has two (SD) card slots, compared with the 6D Mark II’s single slot. It’s almost a tie here, but the Nikon D750 is ever so slightly better with a 1230-shot official battery rating. The 6D Mark II offers an official rating of 1200 shots. As the newly announced camera, the 6D Mark II is unsurprisingly more expensive. It will retail for around £2000 when it goes on sale, while you can pick up the D750 for around £1,629 at the moment (both body only). On paper, it seems the Canon 6D Mark II has the upper hand when it comes to overall performance. It has a higher resolution sensor, 45 cross-type AF points, a newer processor, a fully articulating screen and is smaller and lighter. Meanwhile, the Nikon D750 can offer a 100% viewfinder, dual card slots, a (slightly) better spread of AF points, and a tiny bit more battery life. It’s also a few hundred pounds cheaper, too. Canon EOS 6D Mark II vs Canon EOS 6D; Is it worth upgrading?